The Standard Horizon HX400IS intrinsically safe handheld marine vhf radio offers 5 or 1 watt transmit power for power saving and comes with a whopping 2400mAh Lithium-Ion battery that will keep you talking for about 17 hours. Built for reliability and performance, the Standard HX400 will not let you down. 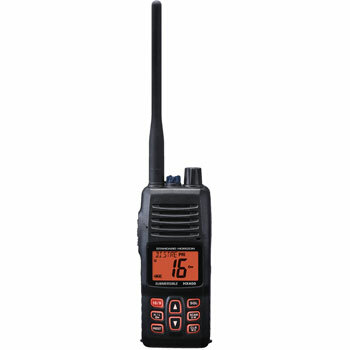 This easy to operate Handheld VHF is intrinsically safe which is a protection technique for safe operation of electronic equipment in explosive atmospheres. HX400IS is water submersible to IPX8 (5’ for 30 Minutes), and also features a 5 or 1 watt power output. The built in noise cancelling Mic greatly improves voice quality while communicating in noisy environments, ensuring that the end user can understand your message without interference. Loud speaker audio assures you can be heard in loud and windy locations. You can also stay on top of weather with pre-programmed NOAA Weather Channels! Changing between U.S., Canadian, or International channels is as easy as 1-2-3. The Lithium Ion-Lion supplied battery provides about 17 hours of communication time, and the low battery indicator lets you know when it’s time to re-charge. Every Standard Horizon HX400 ships from the factory preloaded with description of the use of Marine channels (16-Distress, 22A-USCG, 71-Pleasure). Customize these so you can easily understand the use of each channel to suit your personal preference. The Standard Horizon HX440IS can withstand the harshest environments, and you come to appreciate the quality and performance of the great VHF. Each HX400is comes with: HX400 handheld waterproof radio with antenna, Li-ion rechargeable battery pack, 110v charger, charger cradle, 12v cigarette charger, belt clip, owner's manual and a three-year warranty. Included Lithium-ion battery and charger for up to 17 hours of use. Built-in Noise Canceling Mic and Voice scrambler. Loud speaker audio so you can hear your VHF even in noisy conditions. Pre-programmed NOAA Weather channels and Weather Alert. Favorite channel recall and programming - Preset Key. The Standard Horizon FBA-42 Alkaline Battery Tray allows you to use AA batteries in your HX290, HX400 and HX400is VHF Radio. 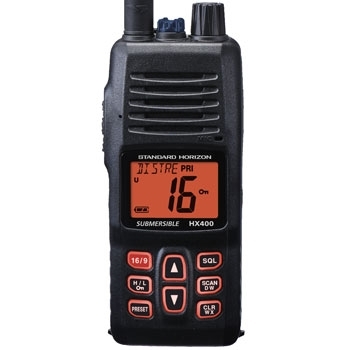 The Standard Horizon HX400 is a submersible 5 Watt VHF radio with 40 programmable land mobile channels. The addition of selectable 5 or 1 Watt power and noise cancelling microphone make this a top notch radio.